Curzon Street Studios is a large media production facility in central Birmingham, opened in 2013, and housing four TV studios, six radio studios and several large photography studios. 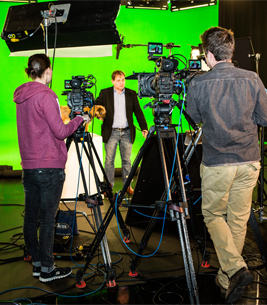 The facility offers both dry and wet hire, for both big and small productions, and forms part of Birmingham City University. The facility's HD, digital studios include broadcast-quality, industry standard equipment. Located in the heart of Birmingham’s Eastside, 15 minutes walk from Birmingham New Street, with parking located to the rear, the studios provide easy access space for any production. The studios are serviced by an on-site catering team and there is specialist access for vans and equipment, with easy access to studio floors. Three broadcast quality multi camera TV studios of varying sizes, each with dedicated control rooms and local master control rooms, two with dedicated 5.1 audio galleries. Autocue is available throughout. A Green Screen studio, equipped with a motion control rig, MILO. Twelve Sony HD cameras in total across all studios. Autocue is available throughout. Each studio has access to record and playback to the tapeless digital asset management system. This also allows access to further use of post production facilities through the integrated broadcast system embedded within the whole Mediahouse. Three craft Avid video suites, one with a Da Vinci Resolve colour grader. All are connected to the shared storage. Two Pro Tools 5.1 audio suites, one with a dedicated voiceover booth. Twelve Sony HD cameras in total across all studios. Configurable talkback between all areas of the media centre. Male and female make-up and dressing rooms including showers. Six fully soundproofed digital radio studios. A Central Technical Apparatus room provides the backbone to the Mediahouse allowing for bespoke technical facilities to be engineered. Goods-in lift – with a 4000kg capacity, with door access (2100mm wide) connecting studio floors to the service yard. Curzon Street Studios is part of the University’s Birmingham School of Media, making it the ideal place to support your production through our select pool of talented young media professionals, who are available for hire. Why not book a tour? Like to see it for yourself and meet our team? Use our enquiry form to book a tour.